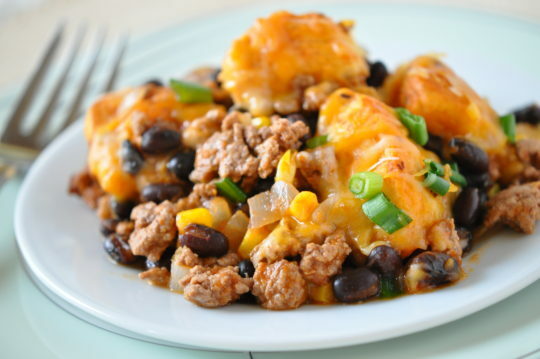 Zesty, meaty casserole with a biscuit surprise — you will be amazed at how extraordinarily tasty this simple combination is. This recipe has become so popular in my family. This recipe is from Holly Clegg’s trim&TERRIFIC Kitchen 101: Secrets to Cooking Confidence. Preheat oven 350°F. Coat 13x9x2-inch baking dish with nonstick cooking spray. In large nonstick skillet, cook meat and onion until meat is done; drain excess fat. Add enchilada sauce, tomato sauce, black beans and corn, stirring well. Cut biscuits into fourths and stir into meat mixture. Transfer to prepared pan. Bake 25 minutes. Remove from oven, sprinkle with cheese and green onions. Return to oven and bake 5-7 minutes more or until cheese is melted. Terrific Tip: Use kitchen scissors to make cutting biscuits easy. If you have trouble finding enchilada sauce, you can substitute salsa.